First of all, I should preface this by saying I’m no rocket scientist. Anyone who has ever seen me attempt to open a carton of milk can attest to this. But that doesn’t mean I can’t daydream. And today I’m daydreaming about how China could land on the moon as quickly and cheaply as possible. Within five years, let’s say. I don’t have an especially good reason why I was thinking about this, other than I think China landing taikonauts on the moon would really shake our (as in the US, and NASA) asses up and get us back out in space with renewed vigor. Especially if the rumors were true that China was developing a special spacesuit that would allow their taikonauts to urinate on our flag and footprints. China’s manned space program has so far been one of very slow and steady progress, relying on hardware derived from old Soviet designs (though significantly modernized and improved) and undertaking missions only when they’re good and ready. Which is why what I’m proposing is really terribly unlikely, but it’s still an interesting thought-experiment. What if, for some reason (let’s say a large deposit of lunar goldopiumoil was discovered on the moon) the Chinese were motivated to get people to the moon as quickly (and cheaply) as possible. To do so, they’d need to rely on as much existing hardware as possible — there’s just no time to develop a lot of new spacecraft and systems. Could it be done? Since China doesn’t have a man-rated heavy launcher just yet, we’ll use a pair of Long March 2F rockets — the ones China is already using to launch Shenzou missions. The first Long March would send up a pretty much the same Shenzou spacecraft they’ve been launching manned since 2003. There would be a couple minor differences: the heat shield on the return capsule would likely need to be beefed up to withstand a more rapid re-entry, and the internal layout of the Orbital Module (OM, that cylinder on the front of the Shenzou) would be organized for a very specifIc purpose I’ll get to in a moment. I think everything else can remain pretty bone stock. The second Long march would carry — in maybe a slightly larger payload fairing — the one piece of new hardware — what I’m calling the Landing Unit (LU). The LU is basically four Shenzou service module engines (the same one used now — it’s one engine with four nozzles, so it looks like 16 engines here! ), some large, extended fuel and oxidizer tanks (and likely O2 and water tanks, since this is a longer than normal mission), all housed in a simple framework that includes four landing legs. The LU is a combination lander-bottom-half and auxilliary propulsion unit. 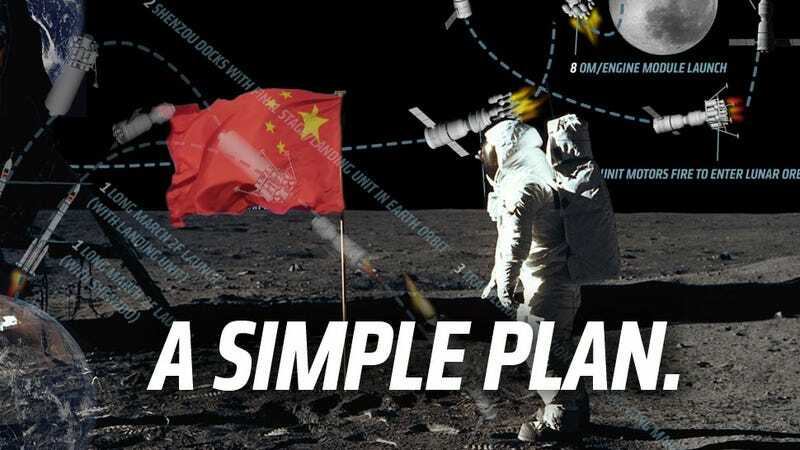 The key here is China does not need to develop an entire lunar lander because the Shenzou orbital module is capable of handling all of the life support, power, and orbital maneuvering needs of a lander already. Shenzou orbital modules have operated independently in Earth orbit for months at a time — with a set of legs and some extra engines, it should be able to function as a lander no problem. The reason I’m suggesting four Shenzou main engines is that each engine makes a bit over 10 kilonewtons of thrust, and, based on what we learned from Apollo, you need around 40 kN or so do accomplish a lunar orbital rendezvous mission. So we’ll just grab four of those from the parts warehouse, a bunch of tanks, and get some of the kids down in fabrication to weld us up an aluminum frame and some deployable landing legs. The LU, ideally, should have a lot less mass than a usual full-up Shenzou, which is good, since I want to use all of that unused potential and fuel from the Long March’s upper stage to send the LU, now docked to the full Shenzou, off to the moon. I feel like that should work, but I encourage someone at the Chinese Space Agency to maybe run the numbers really quick to be sure. So, we use the Long March upper stage to kick off to the moon, discard the stage when empty, and coast. We’re using the Apollo playbook here, since we know that works. We’ll use the four engines in the LU to slow us down to enter lunar orbit, and then, while we’re parked there, one of the crew (I’m thinking a crew of just 2, to limit need for consumables) will climb over into the OM/LU complex that we’re using for a lander. So, lander crewperson undocks, and takes the lander down to the moon, while our lonely other crewman hangs out in the Shenzou return module, peeing into plastic bags and probably playing games on his or her phone until they remember they left their USB cable in the OM. The OM/LU touches down on the moon, using the four throttle-able engines, makes a soft landing that hopefully the landing legs absorb the impact of just fine, and our moonwalker can then exit the OM, climb down, and jump around on the moon. Maybe they can find the old US lunar rovers and go for a joyride. If China is smart, they’ll land near one of the Apollo sites and grab some little souvenirs to sell on eBay to cover the costs of the mission. We’ll be pretty pissed, sure, but I bet it’ll get us back to the moon in a hurry. I’m thinking we’ll keep the on-surface time pretty short — basically just a few hours, or enough time for the Shenzou to orbit back into position. When the time is ready, the Taikonaut gets back in the OM/LU, re-ignites the four engines, and takes off, this time leaving the landing legs and associated framework behind. The OM/landing engine unit then re-docks with the decent/service modules of the Shenzou, and the landing unit engines fire again, this time to leave lunar orbit and get back onto a path to go to earth. Once back in Earth orbit 3 or so days later, either the landing unit engines fire one last time to brake to enter orbit, or the Shenzou’s normal main engines fire. The OM and landing unit engines are jettisoned, and the Shenzou return capsule re-enters the earth’s atmosphere pretty much like at the end of any other mission. And that’s pretty much it! A whole moon landing mission, and all they’d need to do is slap together four engines they already make, some extra fuel/oxidizer/consumables tanks, and a landing leg support system. Hell, they can do that by 2020, right?